Recently, the scientific community was all excited because a new exoplanet was discovered, and this one is in the coveted “habitable zone” that makes real estate so valuable, and it’s even pretty close by! 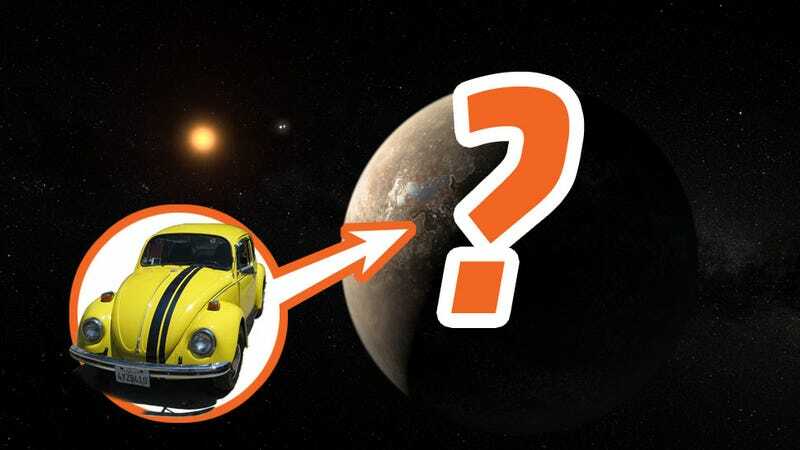 It’s called Proxima Centauri b, and I want to know how well my car is going to drive when I get it there. Sadly, we just can’t say yet. Proxima Centauri b is a mere four or so light years away, and “potentially habitable,” which is enough for me to start planning what cars I’m going to bring with me when I set up my New Fresno colony there. Let’s assume there’s an atmosphere there with enough O2 to support both human life and engine combustion, two things I enjoy here on earth. Let’s also say that the surface is solid and reasonably drivable, because, again, why not. What I want to know is how will the performance of my cars be affected on this planet? Here’s what we do know: the mass of the planet is 1.3x that of Earth. Does this mean that things will weigh 1.3x what they do on Earth, ruining my vehicles’ carefully-tweaked power-to-weight ratios? I’m not certain. We don’t know enough about it yet for me to tell you how strong its gravity is. We found Proxima Centauri b using a detection method called the “radial velocity method”. It’s where we look to see if a star is getting tugged around by a planet we can’t see. Think of it like a dad swinging his kid around by the arms. The kid’s weight is going to make the dad wobble back and forth a little. The same thing happens to a star as a planet orbits around it. The radial velocity method lets us figure out how massive the planet must be, because the more massive the planet, the more it tugs the star around. Or, actually, it lets us figure out the minimum mass the planet has to have. If the planet’s orbit around the star is tilted, then the change in the star’s light is less than if the planet’s orbit is directly towards and away from us. We’re 90% certain that Proxima Centauri b is somewhere between 1.3 times as massive as Earth and 3 times as massive as Earth. But that’s not why I can’t tell you what joyriding on Proxima Centauri b is like. The big problem is that we don’t know how wide around the planet is. We haven’t seen it directly. We’ve just seen its effect on the star Proxima Centauri, and that only depends on how massive the planet is. And a planet’s gravity depends on how dense it is. If Proxima Centauri b is really big, then it’s not very dense, and its gravity will be lower. If it’s smaller, then its density is higher and its gravity will be larger. We probably won’t know more about Proxima Centauri b until we can see it directly. And to do that, we need better telescopes than we’ve got right now. We’re building a couple of telescopes that should do the trick, but they’re not going to be finished until the mid-2020s. So, er, I guess check back with me in a decade to see if we can do donuts on Proxima Centauri b. Knowing the mass just isn’t enough. To know the gravity, we have to know the density, and until we know the size of the planet, we just can’t compute how dense it is. If we can’t compute how dense it is, we can’t know what the surface gravity will be, so we can’t know the weight of the car, so we don’t know how big a turbo I’ll have to slap on my Beetle just to get to 60 before Alpha Centauri sets in the (presumably) West. It looks like I’m going to have to wait until 2020-something to get an answer, so I guess I’ll just plan for the worst and start saving up now for a crazy monster engine. Hopefully we’ll also know a little more about the planet by then, too. I wonder if I should pack shorts? Also, what's the cool part of the planet?